The known challenge of underutilization of data and biological material from biorepositories as potential resources for medical research has been the focus of discussion for over a decade. Recently developed guidelines for improved data availability and reusability—entitled FAIR Principles (Findability, Accessibility, Interoperability, and Reusability)—are likely to address only parts of the problem. In this article, we argue that biological material and data should be viewed as a unified resource. This approach would facilitate access to complete provenance information, which is a prerequisite for reproducibility and meaningful integration of the data. A unified view also allows for optimization of long-term storage strategies, as demonstrated in the case of biobanks. 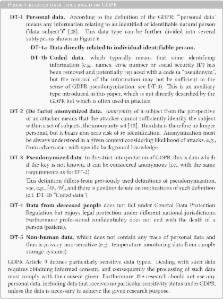 We propose an extension of the FAIR Principles to include the following additional components: (1) quality aspects related to research reproducibility and meaningful reuse of the data, (2) incentives to stimulate effective enrichment of data sets and biological material collections and its reuse on all levels, and (3) privacy-respecting approaches for working with the human material and data. These FAIR-Health principles should then be applied to both the biological material and data. We also propose the development of common guidelines for cloud architectures, due to the unprecedented growth of volume and breadth of medical data generation, as well as the associated need to process the data efficiently. Drug development: Raise standards for preclinical cancer research. [ 1 ]BBMRI-ERIC , Graz, Austria. [ 2 ]Technical University of Munich , Munich, Germany. [ 3 ]TMF e.V. , Berlin, Germany. [ 4 ]BBMRI.mt and University of Malta , Msida, Malta. [ 5 ]BBMRI.it and Universita degli Studi di Milano-Bicocca , Milano, Italy. [ 6 ]BBMRI.gr and Foundation for Research and Technology-Hellas , Heraklion, Greece. [ 7 ]BBMRI.pl and Wroclaw Research Centre EIT+ , Wroclaw, Poland. [ 8 ]BBMRI.pl and University of Łódź , Łódź, Poland. [ 9 ]Helmholtz Zentrum München , Munich, Germany. [ 10 ]BBMRI.it and CRS4 , Pula, Italy. [ 11 ]BBMRI.tr and Acibadem University , Istanbul, Turkey. [ 12 ]BBMRI.IARC and International Agency for Research on Cancer , Lyon, France. [ 13 ]BBMRI.cz and Masaryk Memorial Cancer Institute , Brno, Czech Republic. [ 14 ]INSERM , Paris, France. [ 15 ]BBMRI.at and Medical University Graz , Graz, Austria. [ 16 ]BBMRI.nl and Leiden University Medical Center , Leiden, Netherlands. Copyright statement: © Petr Holub et al., 2018; Published by Mary Ann Liebert, Inc. This Open Access article is distributed under the terms of the Creative Commons License ( http://creativecommons.org/licenses/by/4.0), which permits unrestricted use, distribution, and reproduction in any medium, provided the original work is properly cited. Applications and challenges of DNA microarray technology in military medical research. Research in emergency medical services for children. Blood plasma reference material: a global resource for proteomic research.